Coming from a country where the public rest room usually looks like this, I was amazed at how modern and hi-tech Japanese public rest rooms are. Let’s have a look at some of them. 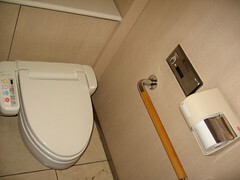 This is the one located at Takashimaya Times Square at Shinjuku.The toilet has a multitude of washer modes, and it has an electronic sensor (attached to the wall, beside the toilet paper dispenser) for the flush. 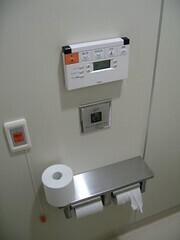 You should put your hands over the sensor (the black rectangle on th wall panel) about 3 seconds for the flusher to work. Neat! A little note though, for a rest room as sophisticated as this, the toilet paper dispenser looks like it came from the medieval times. 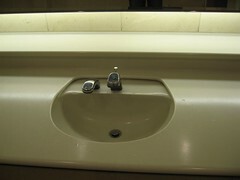 This is the washbowl from the same restroom of Takashimaya Times Square. 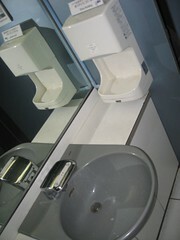 I know that automatic water faucet is not a big deal even here in Indonesia, but look at the faucet beside the main one. It’s a liquid soap dispenser. That’s not something common here. This hand-dryer from Takashimaya Times Square is also unique for me. Whereas a typical wall-attached hand-dryer in Indonesia blows air downward, this one is used by inserting your hand into the gap between the white panel in front and the hand-dryer’s back panel. 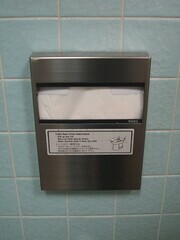 So, the air is blown straight to your hands and the excess water will drip onto the inside of the hand dryer. Whew, that’s a little hard to describe. Now this is a patient restroom in University of Tokyo Hospital. I forgot to take a picture of the door. There is a large red and green button on the wall, about waist level, beside the sliding door. The green one is marked with “open” and the red one is marked with “close”. 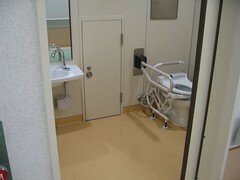 As you see, the restroom has a generous amount of space – something you definitely won’t see in typical Japanese restrooms –, able to accomodate a person on a wheelchair. This is still from the University of Tokyo Hospital, but from a regular restroom. The panel for the washer is located on the wall, still with various settings and washer modes. 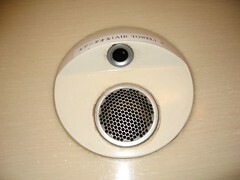 The flusher is also operated with a light sensor. This one is not quite hi-tech. 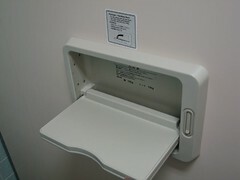 This is a dispenser for the toilet seat cover. It is uncommon here in Indonesia. This was taken in Tokyo Disneyland. This is also not hi-tech. It’s a foldable rack inside the toilet cubicle. Kinda nice, I think. I also saw a toilet cubicle equipped with a seat for toddlers. 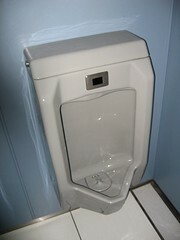 This enables daddies to put their toddlers inside the seat while conducting their business with nature. This was also taken in Tokyo Disneyland. 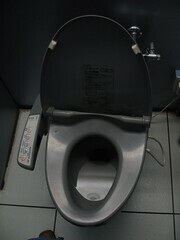 This is the toilet bowl inside Sony Building at Ginza. Still with the same hi-tech washer control, but this time the toilet seat is equipped with seat warmer (notice the cable on the right-hand side). This picture is still taken from the Sony Building. As you can see, the washbowl is equipped with automatic water faucet. The hand-dryer is different with the one above. Now this is a typical Japanese urinoir. No button needs to be pressed to flush it. More hygienic, I think. 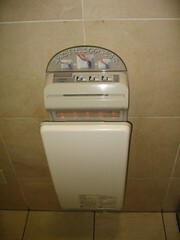 This hand dryer is installed in the restrooms of Narita Airport Terminal 2. It is attached onto the top of the washbowls platform. As you can see from the light sensor on the top part of the image, it’s automatic too. I was intrigued by its unusual shape. Don’t you think so? My blog has become mundane, hasn’t it? I knew it! I knew it! This entry was posted on Friday, 25 May 2007 at 13:08 and filed under Random Shots. You can follow any responses to this entry through the RSS feed. You can leave a response, or trackback from your own site.